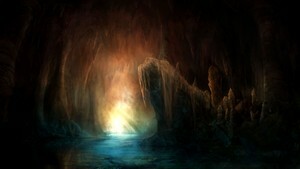 The flooded cavern is a place of vast mystery and deep unseen foreboding danger. Stand in the ankle deep water, close your eyes and absorb every drip of crystal water as it sparkles off the towering walls and a ceiling so high it is lost in the darkness. Or make out across the dark depths with steady oar strokes. The music in this evocative SoundSet is vast and spacious and the monsters hidden in the deep black are feeling peckish. Music - "The long deep pull"
Music - "Quite a hum you've got there"